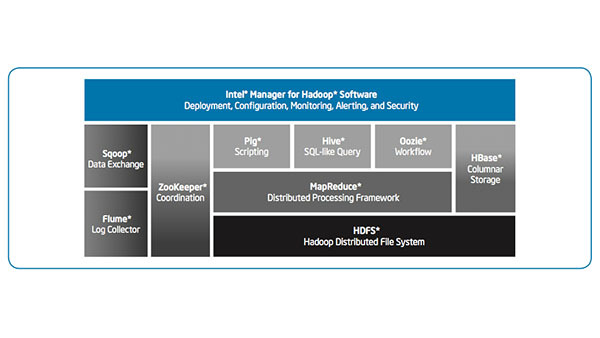 IT Best Practices: Intel IT compared the Intel Distribution for Apache Hadoop software (Intel Distribution) to two other Apache Hadoop distributions using a well-defined set of evaluation criteria. The evaluation criteria included aspects of platform architecture; administration, operations, and support; and the unique value proposition of each distribution. We tested, validated, and graded each distribution against these criteria, and gave each distribution a score. Our evaluation confirmed that using Intel Distribution offers significant advantages over other distributions. The Intel Distribution supports seamless integration with our existing security, management, and analysis tools; features a highly available platform architecture that supports multi-tenancy; includes Intel Manager for Hadoop Software; and is optimized for Intel architecture.